I haven't been too concerned about most of the remakes that have been announced and made over the last few years. Mostly it's because the titles that have been coming out were either in need of an update, not good to begin with or material that I simply don't have a close association to. That's not to say all of the resulting movies have been good, looking back it's safe to generalize that most have been en-par or worse than their originals, but news that the Videodrome adaptation that has been kicking around for a few year has a director and is likely moving ahead, has crossed some invisible line in my mind and entered â€œdon't you dare #%$& it up" territory. Adam Berg has been directing commercials for a few years but it was a 2009 Philips ad called "Carousel" that got everyone buzzing. 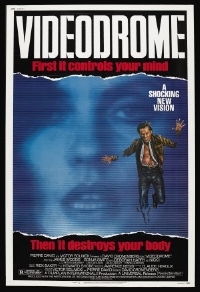 It appears that Hollywood has been looking for a movie project for Berg to head and someone at Universal things he's the man for the Videodrome do-over. I'll be the first to admit that Berg is a talented director and yes, "Carousel" is a stunning ad, I don't even doubt that he could be the perfect guy for this remake but my big question is: why on earth are we remaking this in the first place? It's only going to be a neutered and bland facsimile of the original. It's certainly doesn't help that the story would need a complete overhaul and I just don't see how the very basics (rogue TV feed, videotapes etc.) could be as effective today or with today's technology. The entire thing seems misguided and though I'm not angry at the news, it's not like they're going to steal and burn my glorious Blu-ray, it definitely has me baffled. I hope I'm wrong and this is re-invented so well it becomes a new classic but I'm not holding my breath. eXistenz was a remake of some sorts, with the same McLuhanistic theories incorporated. Why not make a sequel to that? It certainly would make more sense, seeing as we live in a world where video-games are becoming more and more a daily part of life, and it`s technology is rapidly moving forward. It's difficult to create a plausible scifi concept now that reality is moving ahead more rapidly than fantasy in so many places. Much like the old subtitle of the Max Headroom series, what passes for science fiction is only 20 minutes into the future. And if William Gibson's book Neuromancer is anything to go by, much speculative fiction has been re-purposed from being a work of prophecy to being more of a design document. People read it,like it, and then build what they admire. Perhaps the plot premise in Bradbury's The Toynbee Convector where a guy fakes a device to look into the future (in order to get people to actually go out and build it now that they know it's possible) isn't so unimaginable afterall.